It has been an eventful 36 months since ArtTactic launched its first South Asian Art Market report. The disruptive forces of the demonetisation at the end of 2016 and the introduction of the new Goods and Services Tax (GST) in 2017 caused widespread concern in the art trade. Despite this, the South Asian art market has shown a remarkable resilience in this period, with both auction sales and gallery sales growing at a steady pace. 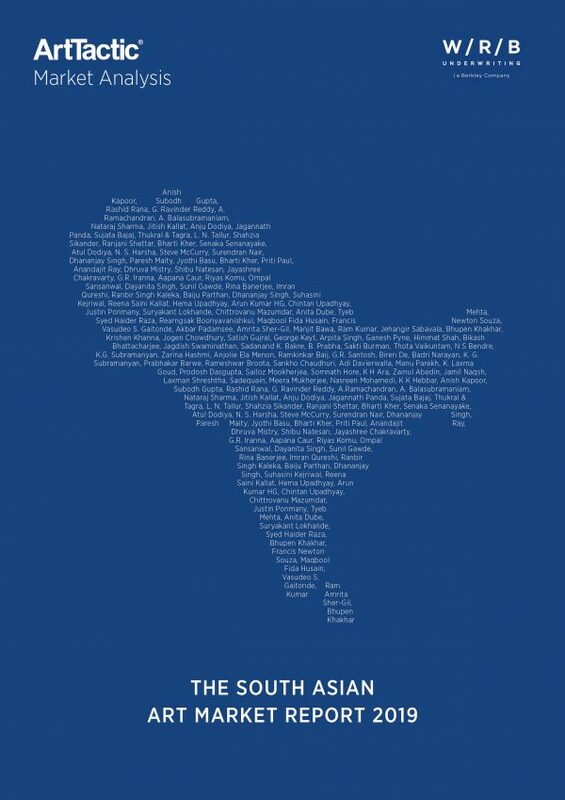 ArtTactic is delighted to launch the third edition of the South Asian Art Market Report 2019 in partnership with W/R/B Underwriting. This year’s edition is looking at the overall South Asian art market, including the gallery sector and auction houses. This year we have also taken a closer look at online sales and buying behaviour, as well as looking at the younger generation of South Asian artists that have broken through in the international art market. The report looks at sales levels, average prices, analysis of different sales channels. 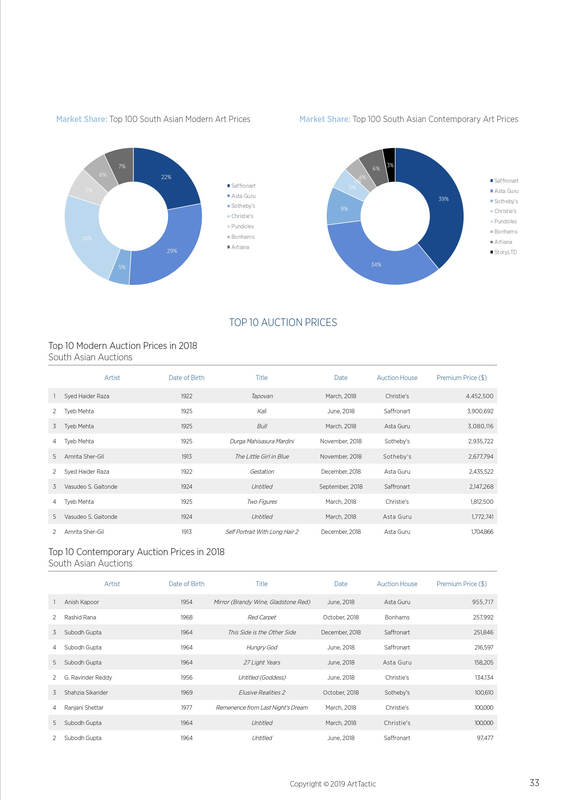 This report is popular among collectors, art advisors, galleries and auction houses. 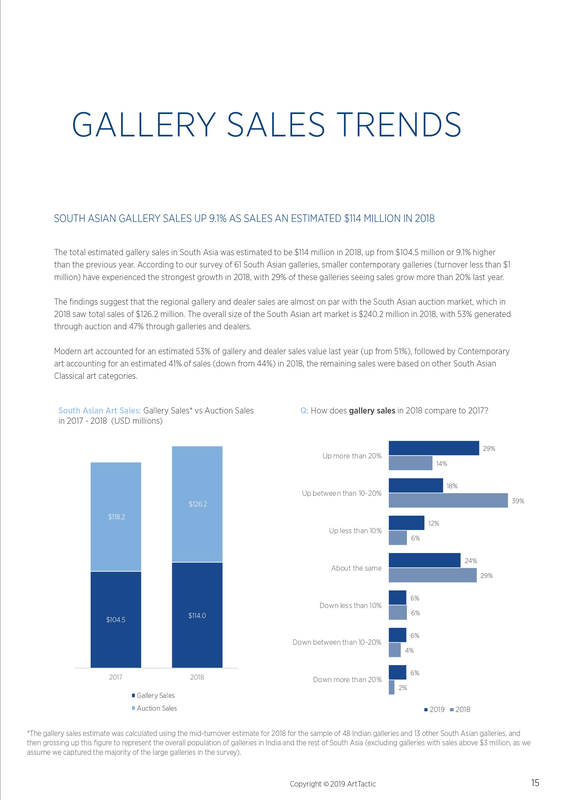 South Asian art market up 7.7% in 2018: South Asian art sales were conservatively estimated at $240.2 million in 2018, up from $223 million in 2017.